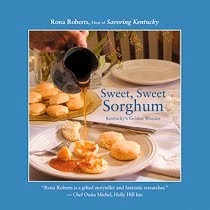 Sweet, Sweet Sorghum goes on a road trip on June 30. By invitation, we will be part of the Horse Cave Bookfest in historic Horse Cave, Kentucky, from 10:00 AM - 5:00 PM CDT, at 112 East Main Street. We will join more than 100 authors, including lots of other Kentucky writers and lots of cookbook writers. We plan to have fun, and we plan to include you in that fun if you can come. Bonus: Horse Cave is less then 20 miles from that "grand, gloomy, and peculiar place," Mammoth Cave, at Mammoth Cave National Park. Mammoth Cave is the world's longest known cave system. Don't like caves? Just find a shady spot under a tree, or a cozy spot in a small café, and indulge in reading Sweet, Sweet Sorghum. Kentucky author and national author book signings, publishers and book dealers. place in conjunction with the New Harmonies: Celebrating American Roots Music. festival, at a dance hall on a Saturday night, or on your radio or your .mp3 player. sounds – new American music. to bring exhibitions and programs to rural cultural organizations. profiled include zydeco, tejano, bluegrass and klezmer.